Oh nothing. 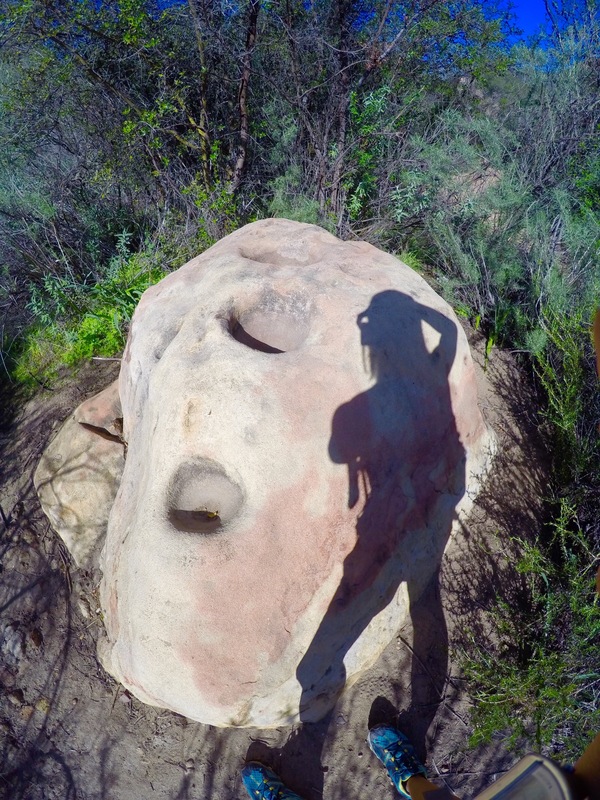 Just hanging out with some prehistoric Chumash grinding stones on a dayhike with Wild Women. Cold Creek Valley Preserve, Calabasas. Acorns for the Chumash were a “starvation food” because they were stored for the lean times when game was less available. A lot of acorns were ground on this trail as you can see by all the grinding stones in this village site. Among the big game they hunted were Grizzly Bear! I think you should check your statement. Acorns where a staple food for the Chumash Indians often as much as 60% of some interior villages. Seasonally whole villages would depart for sites within the Chumash territory in order to harvest Acorns and celebrate Hutash. 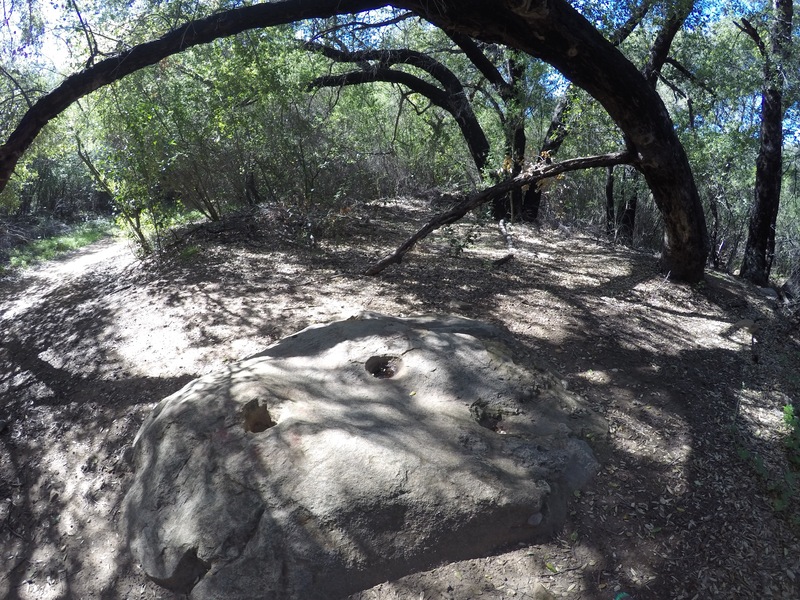 These sites are found all over the Chumash territory and are often marked be older valley and coastal oaks, as well as large bed rock mortars. These mortars would have been used to mash/grind the acorns to be packed into woven baskets and later rinsed to remove the toxins in the acorns before baking. Thank you for the mansplaining, but of course everybody knows the obvious details about acorn gathering and eating that all California children are taught in the fourth grade. This whole website is about the customs of early people of the Southwest, as I’m sure you noticed, because you took the time to look at my whole website before jumping into assuming I know nothing about the topic. That said, I don’t spend much time regurgitating obvious things on this website because I assume anyone interested in this topic already knows the basics. I focus on more esoteric aspects of hunter gatherer lifestyle. I was pointing out a more subtle aspect of hunter gatherer food collection in this short photo post. What I was pointing out is a word that is new to most people, including you it seems, “starvation food”, like I said in the post. Acorns are a “starvation food”, because they are stored for the lean times. Obviously, they were also eaten during times when they were fresh. But as you must know because you are an acorn expert, acorns are not harvested year round. They are harvested once per year then the bulk of them are stored in granaries. Check your facts about that or I can help you find more info. “Starvation food” is something that is stored to prevent starvation later, not at the moment harvested. An example of a food that is not a “starvation food” would be a bird carcass or a rabbit that was just killed today. Nobody would store one little bird or one little rabbit for six months. You pop it straight into the soup. Do you see? Have I helped clarify some of this for you? Perhaps next time, stop a moment and consider that there may be something you could learn from a one-sentence post instead of trying to shame the girl who is speaking. Thank you.